The Astronomic Tour is our most perfect trip through Teide for astronomy lovers, with transport also offered from various points on the island of Tenerife. During this activity, which lasts 8 hours and a half, our Starlight guide will accompany you at all times. Your Astronomic Tour of Teide includes a guided tour in the afternoon to the largest solar observatory in the world, the Teide Observatory, and after the sunset, a stargazing experience using a long range telescope under the clear and pure sky of the Teide National Park, the most visited national park in Europe. It also includes a stop for a meal, not included in the price. You choose whether you prefer to bring your own food, use the Cable Car’s vending machines or buy our optional menu along with your Astronomic Tour. Tenerife is so much more than just sun and beaches. This friendly island is also famous for science and its volcanoes. The Canary Islands are one of the three best spots on Earth to observe the sky. The other two spots, just for curiosity’s sake, are Chile and Hawaii. This is why we are fortunate to have the most important solar observatory here in Tenerife. Did you know that the Teide Observatory began to operate in 1964 and focuses on solar observations and robotic astronomy? It is also home to many solar and nocturnal telescopes, owned by different European countries. 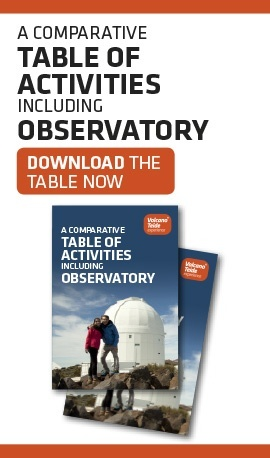 The researchers who work at the institution that manages the Teide Observatory, the Canary Islands Institute of Astrophysics, make great contributions to the field of science, with an average of one publication per day. You will be introduced to the importance of the sky in the Canary Islands, the Teide Observatory telescopes and the different projects of the Canary Islands Institute of Astrophysics, also known as IAC. You will participate in the most interesting astrophysics workshop, held in the Teide Observatory visitors centre, shared with you by our Starlight guides, where we shall explain what astrophysics is and how the astrophysicists in this centre conduct their research. You will enjoy the sun like never before whilst observing sunspots and solar flares through two solar telescopes that we will make available to you. You will visit the inside of a nocturnal telescope and won’t leave until you know how it functions and learn about its exciting history. After the guided visit in the afternoon of the world’s largest solar observatory, included in your Astronomic Tour, what’s better than to enjoy one of the most breathtaking sunsets you can imagine, the spectacular sunset in the National Park, before beginning the stargazing experience, also included in your astronomical night on Mount Teide. It doesn’t matter if you have already been to Teide during the day because the moment the National Park is bathed in the lovely colours of the twilight, you will feel as though you have never been in this beautiful location. It is often said that Tenerife is a fortunate island for its climate. But it is fortunate for more reasons than this. For example: from Mount Teide, it is possible to observe 83 of the 88 officially recognised constellations. You may ask, how is it possible to see so many constellations from Mount Teide? Because there is nothing like the peaks of Tenerife to observe the stars on this friendly island. It is also because the Teide is the best place in Tenerife for astronomical observations, away from the light pollution produced by the urban areas of the island. With the Astronomic Tour guides, you will discover the secrets of the heavens from Teide National Park. You will learn how to orient yourself using celestial objects and enjoy discerning the elements of Greek mythology, which are hidden behind the constellations, and the relationship between them. The astronomical observation included in the Astronomic Tour of the Teide is held in the car park next to the Teide Cable Car base station. You will discover planets, galaxies and clusters like you never would have imagined, thanks to our professional, last generation long range telescopes, which you will have at your disposal to go through the most interesting celestial objects of every night, visible from Mount Teide. In addition, the Astronomic Tour guides will provide you with interesting information about the objects you observe through the telescope. Our professional astronomic instrumentation, together with the transparency and quality of the skies over the peaks of Tenerife, will without a doubt let you enjoy this unique experience. You will already know that the moon passes through different phases during its 29-day cycle, that is to say, lunation. Therefore, at least once a month, the potent glow of our planet’s satellite will dim the faint light of the distant celestial bodies. If you book our Astronomic Tour and enjoy it on the night of the full moon in Teide, you will take advantage of its radiant appearance and be delighted with its splendour: craters, mountain ranges and other lunar wonders. To get you started: Did you know that you can find the Montes Teneriffe, Mons Pico and the crater Piazzi Smyth on the moon? If what we have just mentioned has surprised you and we have left you curious as to why they have these names, write this question down so that you can ask our guides on the night of your Teide Astronomic Tour. Menu. You can buy our optional menu, bring your own food or use the Cable Car’s vending machines. Menu. If you haven’t bought our optional menu, bring your own food or use the Cable Car’s vending machines. Pick-up time depends on the sunset and the pick-ups scheduled for each day; it will be announced to the Customer by e-mail and/or text the day before the activity, which is why we kindly ask you to check your messages. For the same reason we need you to provide the name of your hotel or address of accommodation, as well as a mobile phone number at the time of booking. You should be prepared for extremes in weather, both heat as well as cold, depending on the time of year. Bring warm clothing and proper footwear. Our facilities are located within a protected national park and therefore we must follow a series of basic rules of civic behaviour and respect of the natural environment, such as not littering or taking rocks, plants or animals. Please remember that it is prohibited to make fire, loud noises or to camp. We appreciate your interest in visiting the Teide Observatory (OT) and we hope that you enjoy your visit. The Teide Observatory is not responsible for the difficulties or discomfort caused by not following these recommendations. The arranged visits will only be carried out when the weather and the operating status of the telescopes permit. Due to adverse weather conditions, especially during winter, which may affect the safety of the roads leading to the Observatory (snow, ice, falling rocks) visits may be unexpectedly cancelled. The Teide Observatory (TO) is located at an altitude of approximately 2,400 meters above sea level, an altitude at which oxygen diminishes. Groups will move about within the TO on gravel paths. For this reason, the visit is not recommended for people with general health problems (anaemia, breathing or heart problems, etc.). If you are not sure if you should visit, consult your doctor first. The TO is not responsible for any health problems that can be caused by the altitude or by not following these recommendations and warnings. The TO does not have medical assistance within its facilities. Bear in mind that the closest hospital is approximately one and a half hours away by car. If you show symptoms of dizziness, nausea, shortness of breath, ringing in your ears, plugged ears or headache during your visit, please, immediately inform your guide. Protect yourself from the sun. It’s recommended that you use hats, sunglasses and sunscreen. Due to the low levels of humidity that are common in the TO, come prepared with sufficient liquid (water or juices) to prevent dehydration. Bring comfortable clothes and adequate footwear (avoid sandals). Bring some warm clothes in case the weather changes abruptly and to enter the interior of the telescopes. When you arrive at the TO, centre personnel will be waiting for you at the access gate to let you know what to do with the car or bus. Please always follow the instructions you receive. Remember that there is no need to ring the bell, and please do not block the entrance. You may park in the designated parking spaces while you wait. Please do not forget to bring identification (ID card or passport) and a copy of your reservation to confirm access. If you are unable to produce identification and/or the booking confirmation, the TO/IAC does not guarantee your visit. Due to time limits and visit schedule constraints, the time to use the toilet is before the visit starts. Please leave the toilet as clean as you found it! - Leave the established paths. For your own safety, please remain with your assigned group at all times and follow the instructions given by the guide at all times. In case you are given suits or safety equipment in the facilities area, they should be properly used and cared for. It is absolutely prohibited to leave the safety area or touch anything inside the buildings. The Astronomic Tour is not recommended for people with general health problems (breathing or heart problems, injuries, reduced mobility, etc. ), as groups will move about within the Observatory on irregular gravel paths. Children under 8 are not allowed to participate in early evening and nighttime activities. If you are not sure if you can participate in the activity, consult your doctor before planning your visit. Please bear in mind that you must have a sufficient knowledge of the language in which the visit is held in order to be able to correctly follow the explanations of the guide. Remember that there will be no possibility to eat it during the activity but we will make a stop to eat. Of course, if you bring your own food, you can eat it during the programmed break, though not inside the restaurant. IT IS ABSOLUTELY NECESSARY TO BRING A COPY OF YOUR RESERVATION, EITHER PRINTED OR ON YOUR MOBILE PHONE. You will need coins to use the Cable Car’s vending machines. If it is not possible to carry out the entire activity due to adverse weather conditions, the full amount shall be reimbursed. If it is not possible to visit the Teide Observatory, the price of the entrance ticket to the Observatory shall be reimbursed. In case of cloud cover conditions in the Observatory, the usual itinerary of the visit may be modified. If weather conditions make astronomical observation difficult, an activity at the planetarium will be carried out. Check our Terms and conditions for more information. There are public toilets in the Observatory. Please take into account that the toilets are a 10 – 15 minute walk from the car park. The Teide Observatory is located at an altitude of 2,390 m, in Izaña, on the island of Tenerife (Spain). The entrance is located at km 1 of the TF-514 motorway, which can be accessed from km 37 of the TF-24 motorway. It takes approximately two hours to reach the Teide Observatory from the south of the island, and an hour from Santa Cruz and Puerto de la Cruz. Usually the Carlos Sánchez telescope or the IAC-80 telescope are visited. Lunt LS100 H-alpha B1200 and Skywatcher ED80 with a white light filter for the photosphere. Given that part of this guided tour takes place outside the building and includes stairs and a rocky terrain, we do not recommend the visit for people with mobility problems. No, because it is not permitted to interrupt the scientists’ work. The guide will set up a portable solar telescope outside. Yes, in the visited areas. In the activity in German the following telescopes are used: A Vixen VISAC Catadioptric, 200mm F1800 on a GPD2 with Synscan. A Vixen Neo Acro Refractor, 140mm F800 on a GPD2. A Vixen VMC Catadioptric, 260mm, F3000 on a NEQ6 Pro. Each one of these will point at a different celestial body. Yes. We will pick you up and once the excursion is finished, we will drop you off in the same place. Do I need to print the booking confirmation of my Astronomic Tour? No, it’s not necessary. You can download your Astronomic Tour reservation and display it on the screen of any mobile device (phone, tablet, etc.). Can I change the date of my Astronomic Tour reservation? No changes are permitted after 4pm on the day prior to the activity day. If you wish to change your booking in advance, call us at (+34) 922 010 444 between 9am and 4pm (GMT).